Sam and helpers kept the Youth Band going and we acquired red pullovers for the youngsters, with grey ties and they looked very smart on their engagements. With the help of Senior members we turned out for two carnivals, Brixham Hospital League of Friends and Cowtown, both great successes. For many years the band has supported local charities but there comes a time we need to help ourselves with the cost of replacement uniforms and new music. Some of our instruments have lasted over fifty years with T.L.C. but in time they wear out completely. We are constantly trying to improve on everything, but it is a struggle. At the AGM of 1991 Elizabeth Burnell resigned after many years of faithful service , she felt it was time to give a younger member a chance. Her successor was Mr Peter Robinson who remained Hon. Sec. for some years to come. Our Secretaries over the years have given up many hours of their free time and sometimes take a lot of hassle. It is not a job that anyone can take to so volunteers are few and far between. lt was during 1992 that our solo Euphonium player, President and founder member Eric Jordain became ill and was very frustrated that he could not attend band functions. At one time he was one of the best players in the West Country and was congratulated by the great Harry Mortimer. Sam Little resigned as Chairman and Dave Phillips took over. Sam had been chairman since 1988 and had certainly helped the band immensely. The resignation of Lionel Tatton at the start of the season on the Quay took the band by surprise. Lionel had been a stalwart for many years. A letter of appreciation was sent to him for his valuable work with the band. Sadly he died. not long afterwards. Sam Little stood in and ably carried the band through the season. David Phillips was elected MD at the AGM of 1993 and has instilled an enthusiasm into the band. 1994 was a very busy year and the bands performances improved wonderfully. One of our best engagements this year was to give a concert to the National over 60’s Club run by the Salvation Army at the Festival Theatre in Paignton. lt was a privilege to perform in this theatre and our attendance was much appreciated by the audience. 1994 was a special year and we attended many parades for “D Day” celebrations, these included Brixham, Dartmouth and Buckfastleigh. 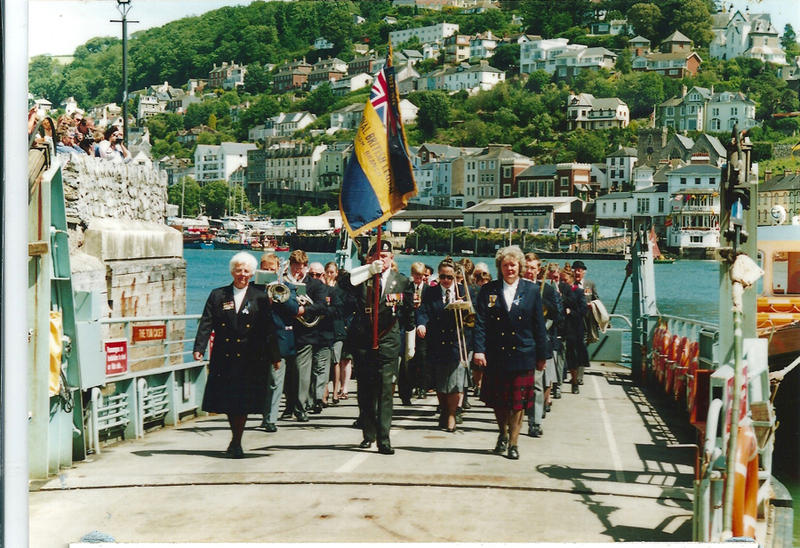 The occasion at Dartmouth was especially exciting as we marched proudly from Kingswear on to the Ferry playing during the river crossing and through the streets of Dartmouth to the Bandstand. We took part in the commemoration service which was also attended by the Royal Marine Band of Britannia Royal Naval College Dartmouth. 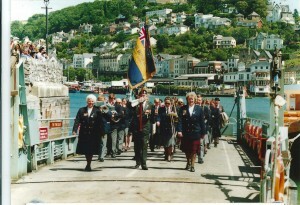 Afterwards we marched back to the ferry and returned to Kingswear playing all the way back to the quayside. We also played at Torcross near Slapton, where many American Servicemen trained during the 1939 — 1945 war. We have played at the Tank Memorial several times in the past in memory of the Americans that lost their lives whilst training during Exercise Tiger. We always feel proud to be asked to take part in these special occasions for Ex—Service organisations. Also during 1994 we performed a special concert with the Brixham Orpheous Male Voice Choir at St. Mary’s Church. 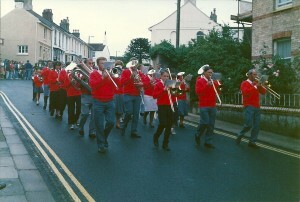 During the AGM that year a discussion took place about the future of the Youth Band. Uncle Sam Little, as he was affectionately known, with the help of a few other senior band members had done an excellent job over the years since 1972. We had been supported by parents and friends throughout these years and we appreciate all their help, without which our band may not be so successful today, but the declining numbers of young people joining the band was causing concern. lt was decided to combine the two bands and start a youth section within the Senior band. This could be achieved by Robert Thomas training them on Wednesday evenings before the rehearsal of the rest of the band. This has turned out to be a great success as the young people can sit in with the main band as they progress and then they feel they are really part of the band. 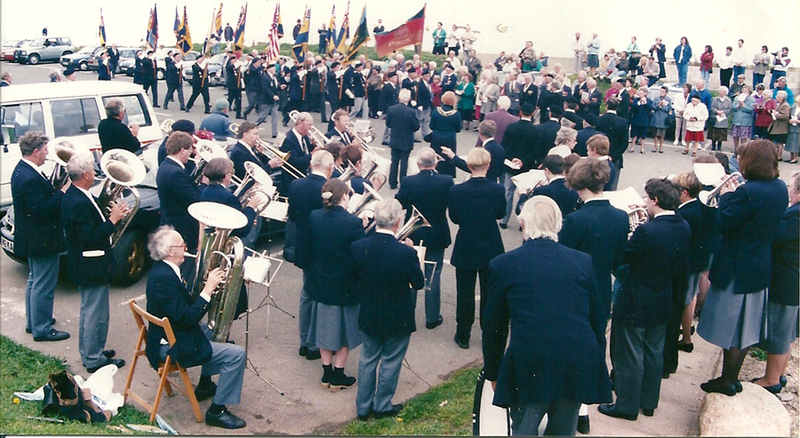 During 1995 we were extremely busy again with parades and services to commemorate the end of the war in Europe, V.E. Day! We were asked to perform all around the area. Altogether in 1995 we attended over 50 engagements including our regular concerts on the Quay. The year of 1996 was our Special 50th anniversary of the Restart of the band in 1946. We celebrated with a concert in the Brixham Theatre during May and all local dignitaries were invited. We were very pleased with our performance. Another proud concert this year was at the Torbay Remembrance Festival on November 8th at the Festival Theatre in Paignton. We have had many admirable comments about our performance and are looking forward to being asked again. Our band is very proud of our last 50 years of entertaining the people of Brixham and visitors to the area and our Service to the Brixham Branch Of the Royal British Legion and we look forward to continuing to do so. Most of the items included in the 50 year History of the Band have been taken from the Minutes of our A.G.M’s and other meetings. I would like to thank retired members and their families for information freely given. I have also included a I few of my own memories and tried to make interesting reading. Also to Sarah my niece for editing and typing same. It was in the year 2001 that the band lost its affiliation to the Brixham Royal British Legion club and along with this its use of the clubs premises for band room and rehearsals. 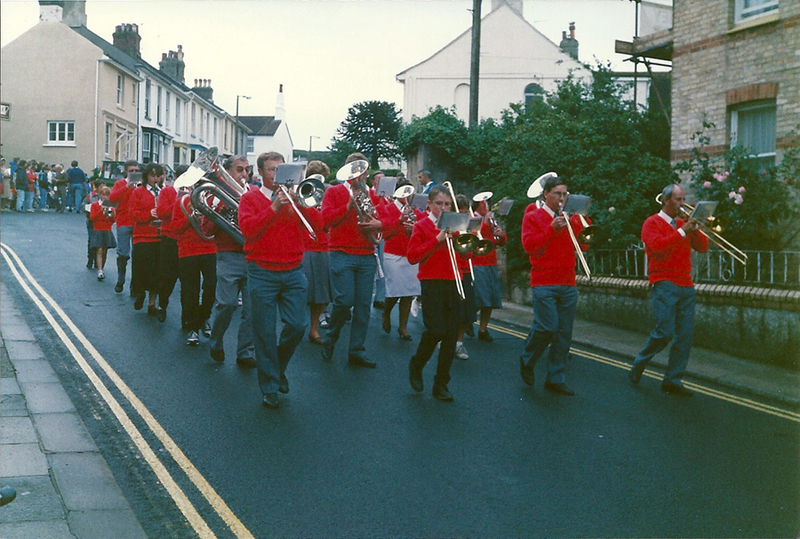 The band was suitably renamed the BRIXHM TOWN BAND and continued with its community support commitments, numerous concert engagements and weekly concerts on the quayside during the summer season.